Jim Stoppani owner of JYM Supplement Science presents Pre Jym. Boasting to be the most effective pre-workout supplement ever developed. We take an unbiased look under the hood and find out the truth. Is this formula solid science or pure BS? 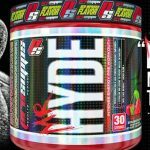 JYM Supplement Science do a range of sports products and we have already reviewed their fat burner Shred JYM. But for now let’s learn more about this particular supplement…. First of all Pre JYM does not contain any proprietary blends. This is a big plus, it means we can determine how effective the formula is overall. You can see precisely what you get from every single ingredient. Containing 13 different ingredients only 5 of those are really going to benefit you when it comes to a pre workout formula. Those are creatine, beta-alanine, citrulline malate, beet root extract and caffeine. 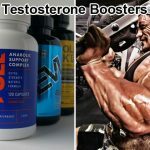 With this formula you should experience some enhanced power and strength, some good muscle pumps, increased energy and some improved mental focus. However this formula seems lacking when it comes to effective cognitive improvements for focus and concentration. The big downsides I see are the potential unwanted side effects that come with the high caffeine dosage and the inclusion of beta alanine. There are also some unnecessary ingredients in there such as the BCAAs. These would be more effective consumed post workout but if you have a solid diet you are unlikely to be deficient in this area anyway. Although this looks to be a fairly good formula, it could have been achieved with far less ingredients. In fact the serving size is huge at 26.5g! That is the same as some whey protein serving sizes! It is recommended that you use a large amount of water to mix it with too. Going to the gym on a potentially bloated stomach is less than ideal. Creatine is one of the better options. A reliable and proven ingredient which is good for power output. Numerous studies have shown that it increases adenosine triphosphate (ATP) in your body; your body uses this to supply energy to the muscles. Therefore by fueling ATP, supplementing with creatine can help to increase both strength and overall endurance. Essentially giving you more reps and sets. This version of creatine is the Hydrochloride version. Believed to be more water soluble than monohydrate leading to a more beneficial uptake by the body. So far there has been no research to prove that it is any more effective than the monohydrate version. Until further studies show otherwise they should have stuck with the monohydrate version. Certainly a popular nutrient when it comes to increasing muscular endurance. However you need to be aware that there are drawbacks. Scientific studies conducted on various athletes have shown that it helps buffers acid in your muscles. This may lead to increases in power output and endurance. The problem is that it also causes the side-effect known as paresthesia an itching/tingling sensation that we will look at later. This amino acid was originally discovered in the plant sugar beet. There is some sketchy evidence suggesting it enhances your strength and endurance with doses of 2.5 g to 6 g taken twice a day. However other studies show that it doesn’t deliver any benefits at all. In fact it can cause you to have fishy odors both on your breath and in your sweat. Found in popular energy drinks although it won’t actually boost energy. It is not actually a stimulant but it does help promote blood flow and circulation in a minor way. It may also help with nutrient absorption but you won’t cause any real benefit to your muscle pumps. This ingredient may help blunt muscle fatigue and keep you training for longer. It may not have much of an effect though as further testing is required. Alpha GPC is a mild brain booster that could help performance. It has been seen in several studies to promote focus and raise power output. This ingredient may help you train longer in the gym, but it’s not the most reliable choice. One of the best amino acids you can take for muscle pumps. Once absorbed the Citrulline is then converted into L-Arginine by your kidneys. L-Arginine is an effective vasodilator which works by promoting nitric oxide, something which improves overall blood flow. The Malic Acid will helps to increase endurance by creating more energy and reducing fatigue. 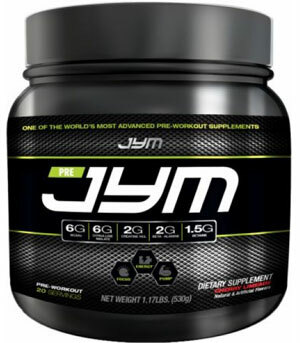 Studies have shown that the optimal dose to take is between 6000-8000mg; so Pre Jym has got the dosage perfectly here. You should expect some great muscle pumps and vascularity in the gym. This is a great natural ingredient which is great for performance. Numerous studies have shown that Beta vulgaris improves levels of nitric oxide in your blood which is key for endurance. If you are looking to go longer in the gym, then this should help. If you have a good diet containing meat, fish & eggs then these won’t make much difference. Either way BCAAs would be more effective for muscle recovery when consumed post workout. This may help with mental focus but not with overall physical performance. This anti stressor amino acid should help to promote the feel good hormones serotonin and dopamine whilst reducing overall stress. You may gain some benefits with focus and concentration whilst working out. When it comes to energy then this is one of the best and most reliable stimulants around – but there is quite of a lot of it here. Study after study have shown its ability to improve energy, power and focus. This makes it ideal for any pre-workout. Pre JYM contains 300mg of caffeine which is a considerably high dosage if you are sensitive to caffeine then it is best avoided. We will discuss the downsides of such a large dose later. Not a great choice for a cognitive enhancer. A few studies have shown that it may have some mild effects when it comes to boosting your mental functions. However it is very under researched and actual results are unreliable. What is known however is that the effects of Huperzine A are easy to build a tolerance to. So it’s not your best option long term if you are looking for effective results. Extracted from black pepper this piperine can help with the overall nutrient absorption of a supplement. It won’t actually have an effect on your performance. More of a brain booster this can help with focus while training if dosed correctly. Unfortunately we believe it is pretty under-dosed. Studies into this nootropic have shown you need 1000 – 2000mg to get the full benefits of its mind enhancing properties. With only 350mg you are unlikely to experience anything. As far as we can tell the UK version is the only version to contain Choline Bitatrate and it is a replacement for Huperzine A. Mix 1 scoop of Pre JYM with 12-32 oz. (350ml- 950ml) of water and drink 30-45 minutes before you workout. This is a lot of supplement to consume before you workout, in fact it is 80 calories per serving which is high for a pre-workout. You will most likely feel quite bloated. Can I double scoop Pre JYM? With every serving you are getting 300mg of caffeine. This is the highest amount you should be taking at any one time. Double scooping puts you at 600mg and its pretty much guaranteed to give you unwanted side effects ruining your gym session. Certainly assess your tolerance for caffeine first before taking more than one serving. 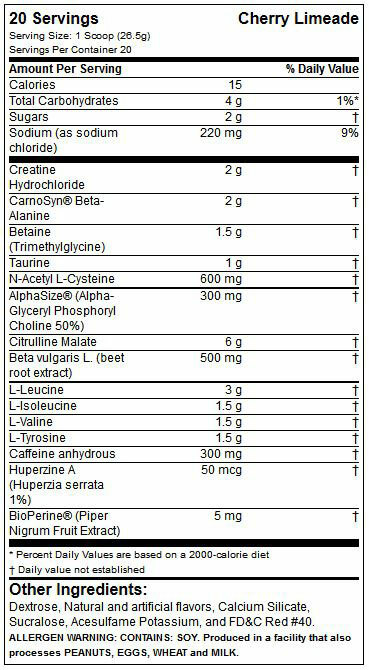 There are a couple of ingredients found in Pre Jym that could potentially cause you problems. The first is Beta-Alanine. Many users have reported that this nutrient sparks a condition known as paresthesia with dosages over 1 g. This causes an itching of the skin especially on the backs of your hands and across your scalp. We have experienced this ourselves and while it is not harmful is hard to focus while training. For some it will be incredibly annoying. The second is caffeine. If you are sensitive to this stimulant then a serving of 300mg is going to give some unwanted side effects. These are things such as headaches or heart palpitations during your workout and energy crashes afterwards. This means all the individual dosages for each ingredient are clearly given on the label. We therefore know how much of each nutrient we are getting and the formula’s overall effectiveness. This is a definite thumbs up and what you should be looking for in any supplement. Caffeine, creatine, citrulline malate, beet root extract and beta-alanine are all proven ingredients backed up by scientific studies. They should all improve physical and mental performance. If you want to do more reps, more sets in the gym or even set a new personal best then this can possibly help. With each serving coming in at 300mg of the reliable stimulant caffeine you are certain to get a large boost of energy. Those with a low tolerance for caffeine need to be careful though. The 6000mg clinically dosed amount of citrulline malate should give you some great muscle pumps in the gym. If you like the pumped up vascular look then this ingredient will do it. It’s not the best for focus and concentration we have come across. Look elsewhere if you want better mental performance from a pre workout. Cherry Limeade, Orange Mango, Raspberry Lemonade exclusive to Bodybuilding.com. 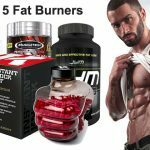 Black Cherry, Natural Island Punch, Refreshing Melon, Strawberry Kiwi at GNC and Amazon. Although customers have mixed feelings about how good they taste. The high caffeine content means there is a good chance you will experience negative side effects if you have a low tolerance to caffeine. Jittery feelings, energy crashes and insomnia are not uncommon. Beta-alanine is notorious for its itching and burning sensations of the skin. This can be very distracting when you want to concentrate and have an effective workout. 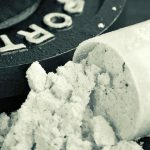 BCAAs are not needed in a pre workout. 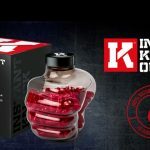 It only adds to the overall cost and bulks up this supplement leaving your stomach bloated after consuming. Better to keep things light before a workout. 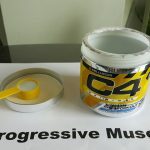 There is no way to sugar coat this, Pre Jym is not cheap when compared to the competition. In some cases 2 to 3 times more. As of writing the Bodybuilding.Com version is $47.97 for 30 servings which means $1.60 per serving. The GNC version is $49.99 for 30 servings which means $1.66 per serving. You can only purchase online at either Bodybuilding.Com or Amazon. GNC also sells it online and you can pick it up in stores. Any country outside of the USA will need to order through BB.com which only ships from the US. This essentially means slow shipping potentially taking over a week or more to arrive. There is simply too much caffeine content to double scoop. 600mg is going to make most people feel really ill and crash hard. What are people saying about Pre JYM? There are actually no testimonials from customers on the official JYM Supplement Science website. So we investigated the main retail websites, Amazon.com, GNC and Bodybuilding.com to find customer reviews. Although very popular overall the reviews are mixed. Some say it is their favorite pre-workout giving them energy and strength. However there were many who have had a bad experiences with cases of feeling jittery, sick, nauseous and wanting to throw up to bouts of diarrhea. These stomach issues came up as well as feeling bloated came up a few times from various users. Other people have issues with the price. At $50 it’s relatively pricey compared to the competition and for that you expect the best experience possible. But many found it fell short of what it promised and have tried better before. The taste was also an issue, with some saying the flavors are ok to others saying it was downright awful and couldn’t drink any more. I love the fact that there are no proprietary blends, this is one of the biggest scams in the fitness industry. Here you know exactly what you are putting into your body. However of the 13 ingredients included only 5 of them are really effective for a pre workout. It seems like these filler ingredients (some of them ineffective and some of them unnecessary) only add to the cost and don’t give you any additional benefit. Consuming such as large shake just before you workout is not optimal in anyway. Do you really want to feel like you just ate a big meal before you exercise? 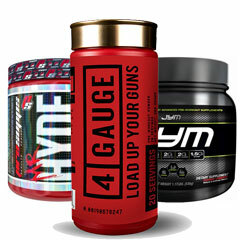 Jim Stoppani has a big & loyal following, so hype certainly plays a factor when it comes to his products. People like to follow the crowd without really looking at the facts. But if you are smart and do your research you can see this is not the most effective pre workout ever developed. Pre Jym from Jym Supplement Science is a good solid pre workout. It contains some great clinically dosed ingredients that promote energy, strength and muscle pumps. Although it is ultimately let down because of the side effects and bloated stomach reported by many users. For such an expensive pre workout supplement this just isn’t acceptable. Overall it isn’t the best we have come across on the market but it is certainly a respectable product. Updated! 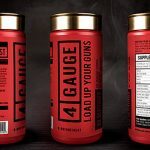 The #1 Pre Workout for 2018! 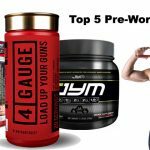 The best selling pre-workout supplements currently available on the market. See the UPDATED 2018 List!